Tomaso Poggio in Genoa, 2011. Tomaso Armando Poggio (born September 11, 1947 in Genoa, Italy), is the Eugene McDermott professor in the Department of Brain and Cognitive Sciences, an investigator at the McGovern Institute for Brain Research, a member of the MIT Computer Science and Artificial Intelligence Laboratory (CSAIL) and director of both the Center for Biological and Computational Learning at MIT and the Center for Brains, Minds, and Machines, a multi-institutional collaboration headquartered at the McGovern Institute since 2013. Born in Genoa, Italy, and educated at Istituto Arecco, Tomaso Poggio completed his doctorate in physics at the University of Genoa and received his degree in Theoretical Physics under professor A. Borsellino. His interdisciplinary research on the problem of intelligence, between brains and computers, started at the Max Planck Institute in Tuebingen, Germany in collaborations with Werner E. Reichardt, David C. Marr and Francis H.C. Crick, among others. He has made contributions to learning theory, to the computational theory of vision, to the understanding of the fly's visual system, and to the biophysics of computation. His recent work is focused on computational neuroscience in close collaboration with several physiology labs, trying to answer the questions of how our visual system learns to see and recognize scenes and objects. Poggio is an honorary member of the Neuroscience Research Program, a member of the American Academy of Arts and Sciences and a founding fellow of AAAI. 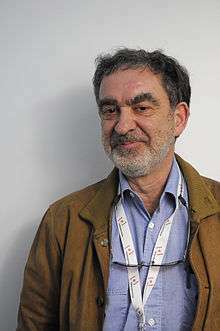 He received the Laurea Honoris Causa in Computer Engineering from the University of Pavia in 2000, the 2003 Gabor Award, the 2009 Okawa prize , and named in 2009 a Fellow of the American Association for the Advancement of Science (AAAS) for “distinguished contributions to computational neuroscience, in particular, computational vision learning and regularization theory, biophysics of computation and models of recognition in the visual cortex.” He is one of the most cited computational neuroscientists. A former corporate fellow of Thinking Machines Corporation, he was involved in starting several other high tech companies. Honorary degree, University of Pavia, 2000. Swartz Prize For Theoretical and Computational Neuroscience,The Society for Neuroscience, 2014. Center for Biological and Computational Learning at MIT. ↑ "MIT Sloan CIO Symposium: Tomaso Poggio". MIT Sloan CIO Symposium. 2015-05-18. Retrieved 2015-05-30. ↑ A feedforward architecture accounts for rapid categorization. Serre T, Oliva A, Poggio T. Proceedings of the National Academy of Sciences of the United States of America. 2007 Apr 10;104(15):6424-9. BBC: Visions of the Future - February 29, 2008 - This is part of the excellent BBC series entitled "visions of the future". This short clip (3min) here shows work performed at CBCL (MIT) about a computational neuroscience model of the ventral stream of the visual cortex. The story here focuses on recent work by Serre, Oliva and Poggio on comparing the performance of the model to human observers during a rapid object categorization task. video demonstration of automatic classification of mouse behavior based on algorithm developed by Serre, Poggio and their colleagues. THE DISCOVERY CHANNEL [Toronto, Canada] by Jennifer Scott (June 17, 2002): Video:Science, Lies & Videotape - Tony Ezzat and Tomaso Poggio. NBC TODAY SHOW with Katie Couric (May 20, 2002): Video:* (100 kbit/s) (300 kbit/s) - Tony Ezzat and Tomaso Poggio. This article is issued from Wikipedia - version of the 4/22/2016. The text is available under the Creative Commons Attribution/Share Alike but additional terms may apply for the media files.